NSW Police Deputy Commisioner Regional Field Operations Gary Worboys, left, Inverell Shire Mayor Paul Harmon, Commisioner Mick Fuller and Northern Tablelands MP Adam Marshall discussing the new Inverell Police Station last week in Parliament. A NEW 24-hour police station for Inverell is step closer to reality after Northern Tablelands MP Adam Marshall and Inverell Shire Mayor Paul Harmon received a firm commitment for a rebuild from NSW Police and Minister Troy Grant at meeting in NSW Parliament last week. 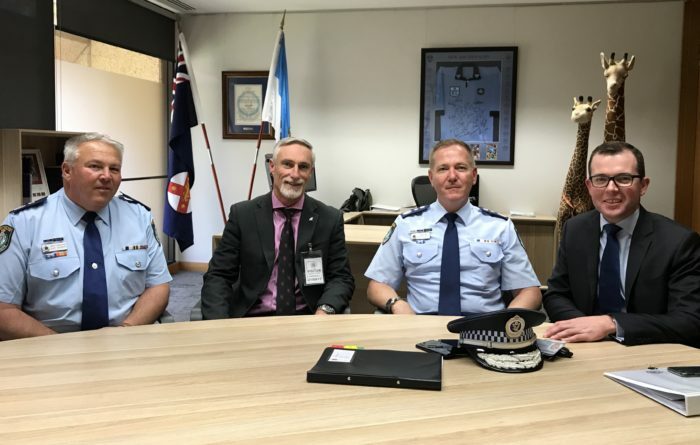 Mr Marshall arranged the meeting, which included NSW Police Commissioner Mick Fuller and Deputy Commissioner Regional Field Operations Gary Worboys, to push the new Inverell Station up the priority list and seek urgent assistance to immediately address structural issues within the existing station. He said the Minister had seen firsthand the urgent need for a new station when he visited Inverell last year and was firmly committed to the project. “It was the most positive meeting I’ve ever been involved in about the new station in Inverell,” Mr Marshall said. “We not only secured unanimous agreement for the new station in Inverell and for it to be delivered as quickly as possible, but also an immediate injection of more than $250,000 to undertake work to address some urgent problems that cannot wait. “The meeting was the first time the Mayor and I have been able to put our case direct to the new NSW Police senior leadership team and I was delighted with the response. Given the number of new stations and other major capital works projects NSW Police is already committed to delivering from the last election, Mr Marshall said that realistically, the community was not going to see a new station in Inverell for at least another 12 months. “It’s not fair on our local police to ask them to work for another 12-18 months in a cramped and inadequate station while our new station is being planned, so I am delighted with the immediate injection of funds to address safety and operational issues within the station right now,” Mr Marshall said. “This is by no means a long-term solution, but it will be a massive improvement on the current conditions, as an interim measure, until the new station is constructed. “In no way does this diminish the case for the new station nor the urgency of it and I am determined to ensuring the Inverell community gets the new police station it deserves. •	solid screening around station for visual privacy during prisoner movement. •	relocation of Aboriginal Community Liaison Officer (ACLO) office. •	install external security access door with video intercom for Legal Aid access to custody area. •	create second soft interview room. •	redirect front police access with modifications to front counter. •	increase muster room size, with integrated utilities area, including provision of combination pigeon hole/brief lockers. •	create separate female locker rooms on first floor to accommodate current staff levels and limited future growth. •	Create a briefing room on the first floor. •	create utilities and general storage room upstairs. •	purchase and install medium relocatable building located behind building located behind custody area for housing Detectives. •	relocate Highway Patrol and Prosecutor and Court Process to rear house facility to facilitate reconfiguration of upstairs spaces as above. •	full reprint of internal station. •	removal and replacement of all old furniture and materials.